The city of Miami on Wednesday opened a permanent public restroom in Downtown. People experiencing homelessness in Miami now have access to a new bathroom after the city opened on Wednesday its first permanent toilet in Downtown. The sleek restroom near the West Flagler street Metrorail station will be open 12 hours a day and features a sink and needle disposal area. Modelled off stand-alone toilets in Portland, Oregon, it runs on solar power and looks like a booth with steel panels. City officials said it could address homelessness problems in the city. The independent agency that helped plan the bathroom, the Downtown Development Authority, has hired people from a Miami homeless shelter to clean the $312,976 loo. "On the one hand, [the bathrooms are] a beacon of hope for those in need," said Miami mayor Francis Suarez at a ribbon cutting ceremony with city commissioner Ken Russell, who's district includes Downtown. "On the other, it helps maintain a clean and welcoming Downtown for residents and visitors." The opening follows a pilot program over the past three years that involved placing portable toilets around Downtown. The Pit Stop program, which has been deemed successful by city officials, was meant to address complaints about urine and feces across the area. At one point in 2015, the Downtown Development Authority even created a "poop map" indicating where people defecated on streets. The bathroom's installment comes as the city faces criticism for its treatment of homeless people. Miami is trying to end a 20-year old legal agreement meant to protect the homeless from unnecessary police harassment. The public restroom features a toilet, sink and needle disposal area. But on Wednesday, Suarez said the new permanent restroom will help the homeless by guaranteeing them the necessary right to a sanitary toilet. Russell added that it will provide sheltered homeless people with job opportunities. The full-time cleaning attendents of the toilet are members of the Downtown Enhancement Team, who have been hired from the homeless shelter, the Camillus House. "It's important that our homeless population have a way to still live somewhat of a dignified live as we are counseling them and coaching them," said Miami-Dade County commissioner Eileen Higgins, who also attended the ribbon-cutting ceremony. As city officials prepared to open the new restroom, people began asking to use it. Kevin Garrett was once homeless for 20 years and now supervises the employees from the Camillus House who will clean the toilet. He said the toilet will be beneficial for both the cleaning attendants and other homeless users of the bathroom. "It gives [the attendants] a chance to get back in the habit of working, being responsible," Garrett said, "and be an example for the next person to say, 'Hey, if they got clean and they're doing this, I can do it too.'" Russell said the Downtown Enhancement Team program has expanded to the Omni area and he hopes it will operate across the city. The city also plans to open more of the public restrooms, he said. 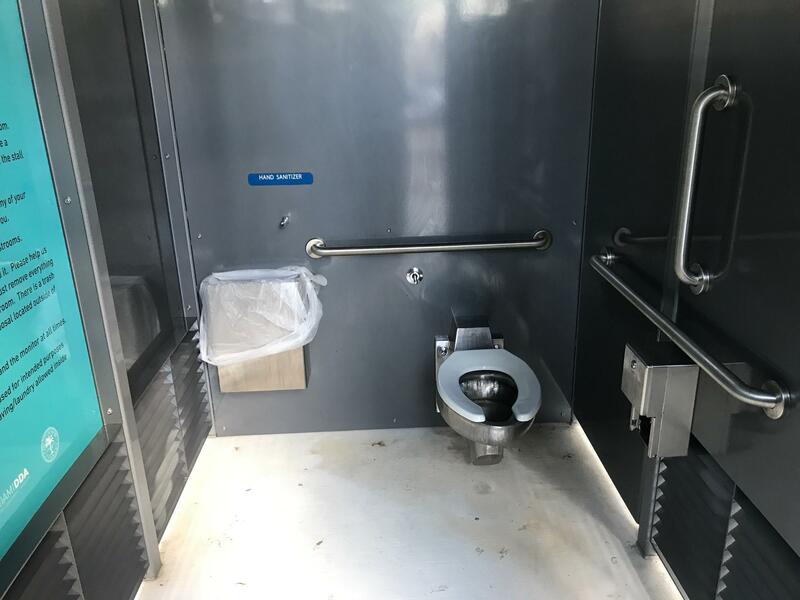 The bathrooms on wheels that have been making the rounds in Downtown Miami over the last nine months are here to stay. This week Miami Mayor Tomas Regalado announced the $500,000 pilot program aimed at giving the homeless access to public restrooms and making them permanent. Ken Russell, vice chairman of the Miami city commission and the chairman of the Downtown Development Authority, says providing basic services for the homeless is in the best interest of the city.